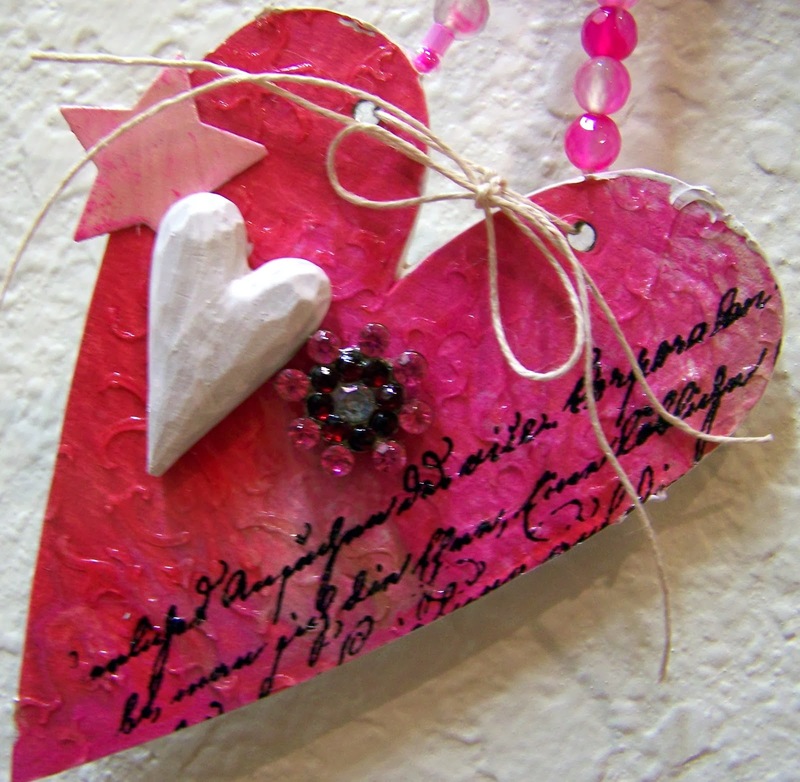 Eclectic Paperie: HEARTS ~ January Get Altered Challenge! Hi everyone. Happy New Year! It's Sue Lelli here and I am hosting the January Get Altered Challenge at eclectic Paperie. The eP Get Altered challenge begins the first Thursday of each month and is an opportunity to explore your creative journey, step outside your comfort zone, and experiment with new products and techniques. 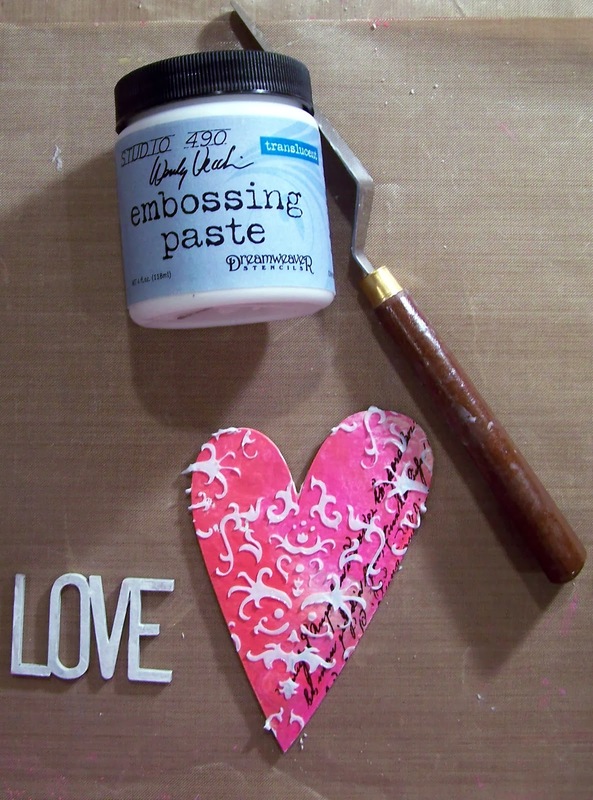 It's all about having fun while creating altered and mixed media art with a chance of winning a $15 gift certificate to the eclectic Paperie shop. 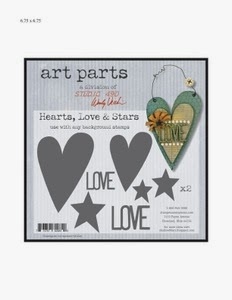 I chose to use a Wendy Vecchi - Studio 490 - Art Parts Hearts Love &amp; Stars kit shown at the end of my post to make my heart wall hanging. This is the largest heart, star, and LOVE word. 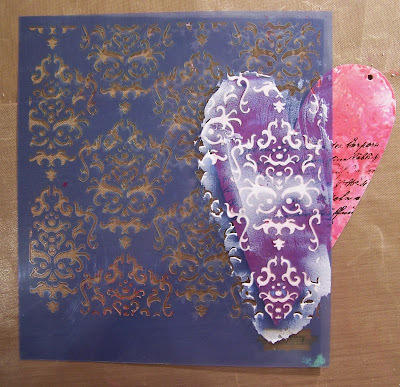 I used Tim Holtz distress paints, a Prima Donna Downey Damask Stencil, and Wendy Vecchi White embossing paste to make this heart. 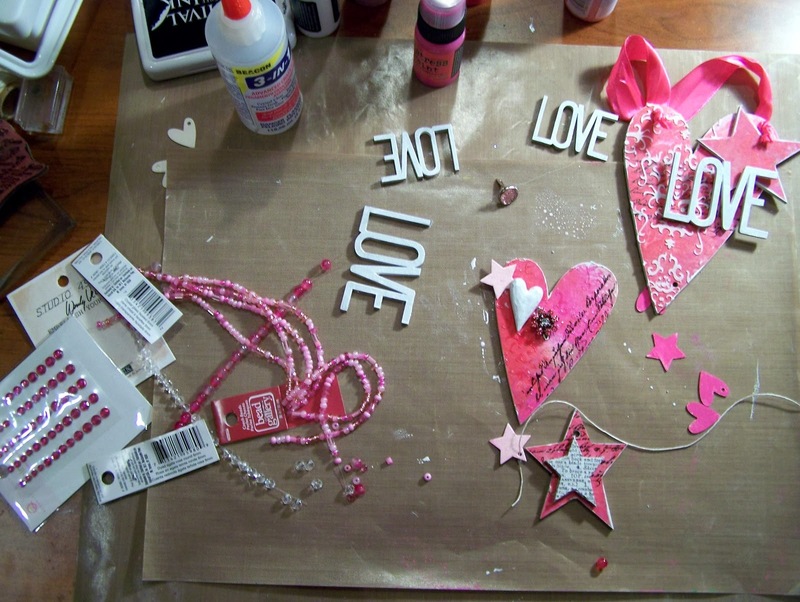 The pink ribbon is from a Victoria's Secret bag! Here's a close up photo so you can see the embossing paste better ~ LOVE! Here are the center stars and beads and gems. Another close up. The text is a Christmas Tim Holt stamp set. I LOVE the font and it doesn't matter that it's Christmas because you can't read it! LOL! 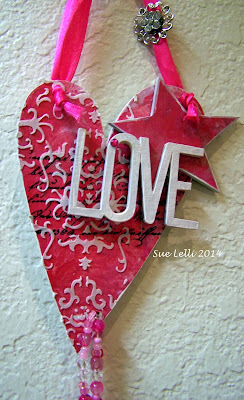 On my last heart I used Wendy Vecchi's Studio 490 translucent embossing paste. 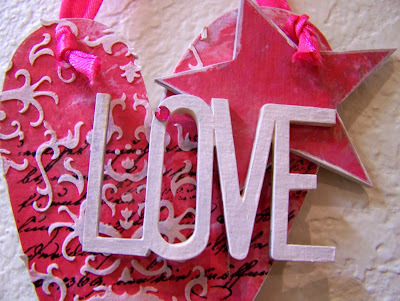 LOVE how it adds texture but you can see the paint colors through it! 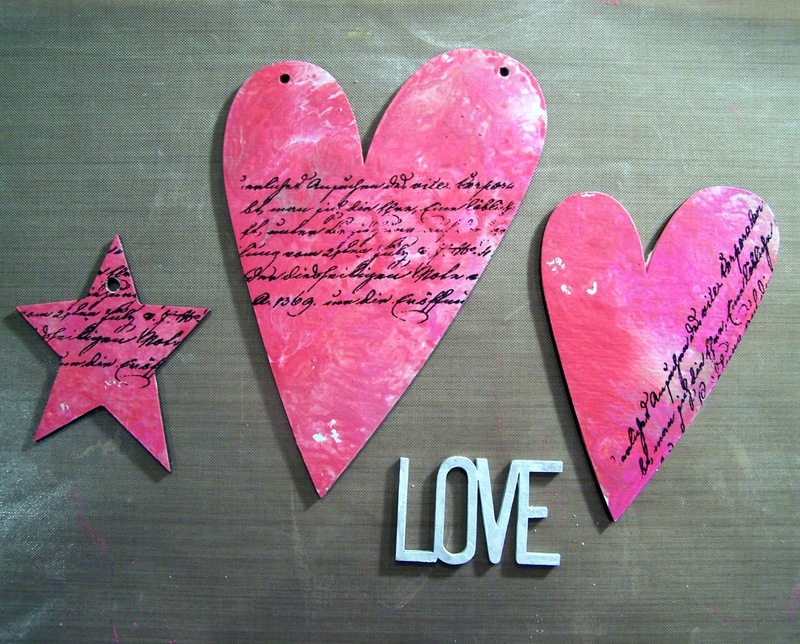 I also added A Wendy Vecchi Blossom Bucket natural heart that I painted white. 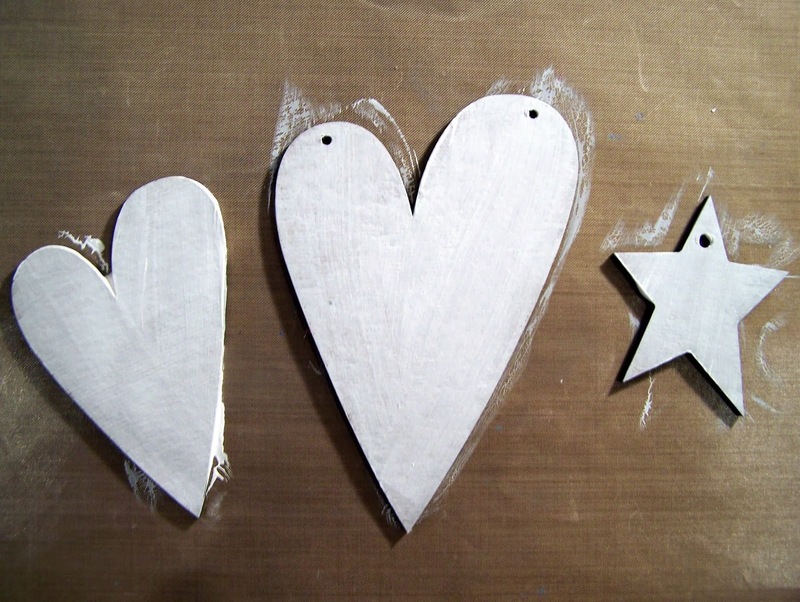 I gessoed the hearts and stars so they would hold the paint. I applied Tim Holtz Distress Paints to my small craft sheet. 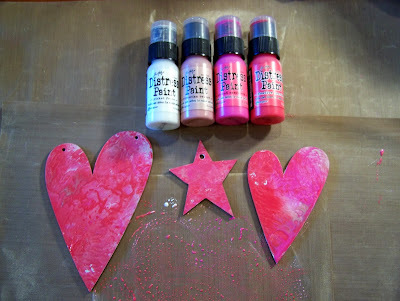 Here they are after I dragged them through the paint ~ LOVE the marbeling effect! 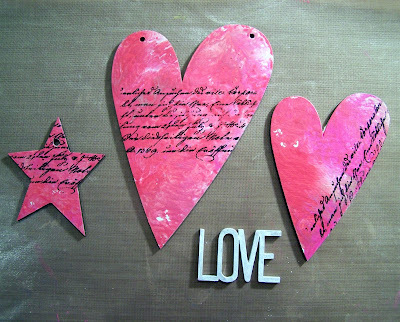 Here is a page in a journal where I wiped my left over paint for a future project ~ NEVER waste this FAB paint! and Wendy Vecchi Studio 490 translucent embossing past to my smaller heart. It looks white when first applied but dries clear as I showed you in a previous photo. LOVE! Here is what the kit looks like when you purchase it with an example of what you could make. Here is what my desk looked like as I was putting my wall hanging together. You are only limited by your imagination plus I have enough pieces left over to make a couple more things! This kit is FUN and I love how easy it is to make holes in it with the Crop a dile. Cuts like butter! Now go get out your hearts and alter something! 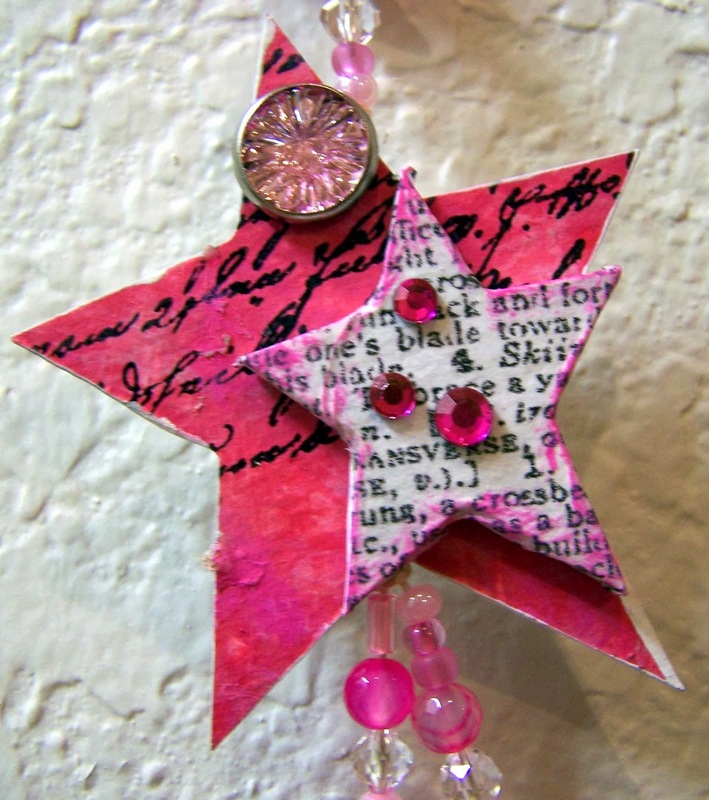 Then link it to the eclectic Paperie's Get Altered Challenge and be entered to win a $15 gift certificate to the EP Shop! 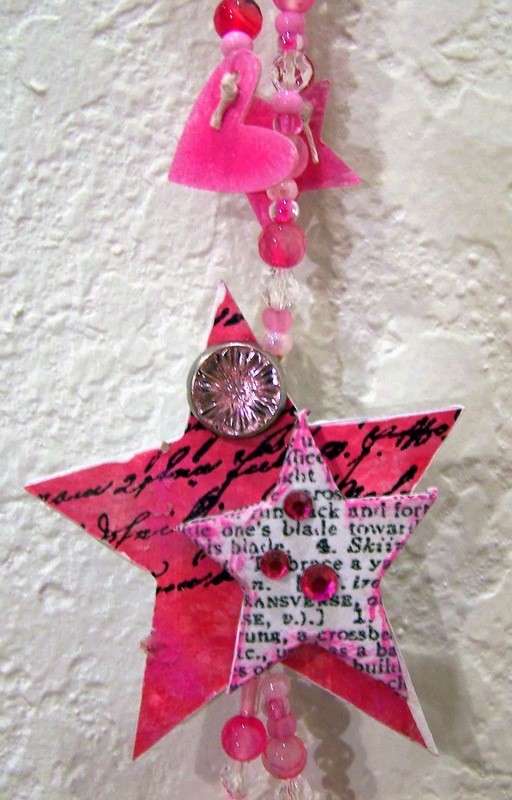 Your hanging is stunning, love those WV Arts Parts and that stencil is gorgeous! Sue, this is gorgeous. I love how you have configured the art parts making the hanging your own. 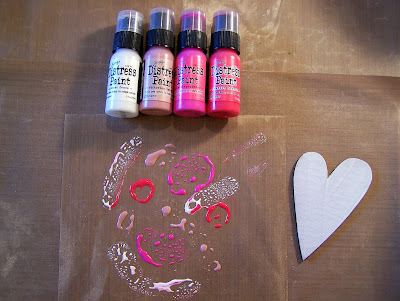 The colours are yummy and the embossing paste and stamping provide wonderful contrast to the brights. Toni is right, this is a fabulous start to 2014. This is beautiful, love the details on your hearts, the textures, the colors ... all so pretty ! Gorgeous Sue and I love how you "finished" it with the beads.... I'm always at a loss when it comes to creating "hangings" for such projects. 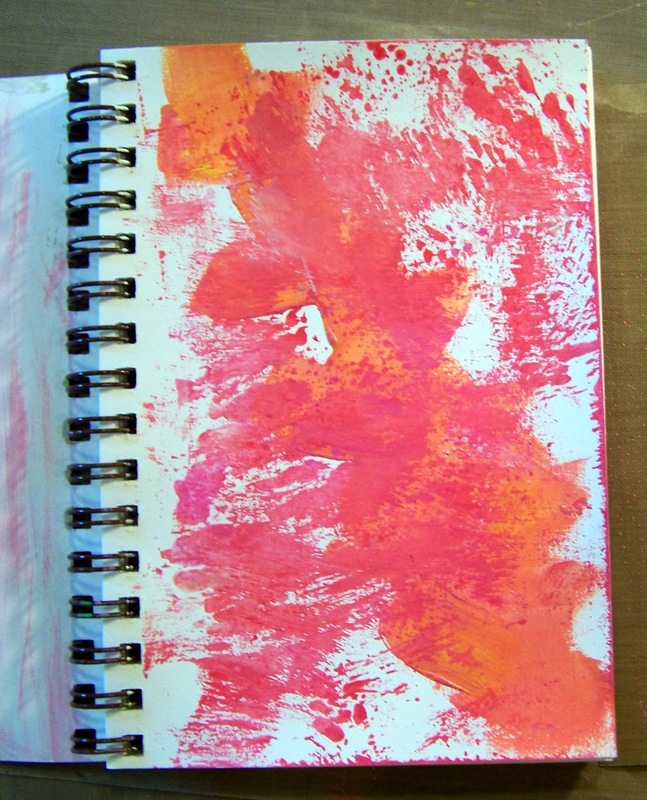 Love the colors and yes, I "clean" my brushes in my journal or papers and save every scrap. I just love all the awesome details and the colors and textures of this project! Wonderful! I love all the bling and detail. This hanging is amazing. Great challenge for the month. Adding mine tomorrow..so sorry it`s so late in coming.